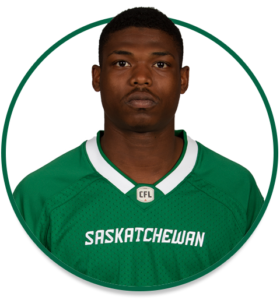 PRO: Signed with the Riders in May, 2018. 2018: Started 10 regular-season games…had 32 receptions for 475 yards and one touchdown…recorded one 100-yard game (126 – Sep. 30 at MTL)…added 29 punt returns for 389 yards and two touchdowns, and three kickoff returns for 82 yards…started the Western Semi-Final…had four punt returns for 67 yards and one missed field-goal return for 25 yards. COLLEGE: Spent four seasons at Austin Peay (2014-17)…played 34 career collegiate games with the Governors…had 38 receptions for 553 yards and three touchdowns …added 39 carries for 184 yards and two touchdowns…had 43 kickoff returns for 889 yards and one touchdown, and 14 punt returns for 48 yards…named Second Team All-OVC as a return specialist in 2016.